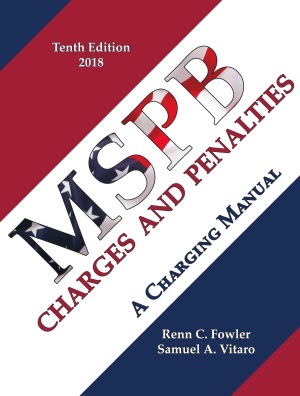 MSPB Charges and Penalties: A Charging Manual is the bible on adverse action charges, charge drafting, proof requirements and elements, defenses to each charge, and penalties. This tenth edition is reorganized to maximize, in a quick, easy-to-master way, all charges, rules, applicable law, nuances, and tips to win. Part I is a close cousin to a military charging manual, listing virtually all charges, their nuances, elements and proof requirements, the prominent cases won and lost on each charge, as well as the pros and cons, pitfalls, and defenses on each charge. 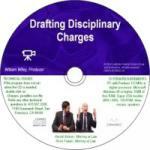 Part II details how to select and draft charges and how to avoid charging errors, including tips on how to use easy-to-prove charges. Part III covers the Douglas factors, penalty deference, how to make a penalty showing, and how to avoid penalty missteps. Both Parts II and III offer extensive discussion on providing clear notice, distinguishing between constitutional and statutory violations, as well as tips on avoiding common due process traps. A key feature of these two parts: each chapter provides at its start and conclusion Quick-Guides in bullet form containing the essentials and need-to-know nuances in that chapter. These comprehensive checklists are a must-know for counsel (agency and private), union representatives, and HR personnel. A new Part IV details affirmative defenses usually invited by certain charges. The critical topics are back and updated. Updated annually with case law and regulatory changes. This edition features a completely reorganized text, following closely to the charging process. A special addition this year is a new "Part Four" featuring a detailed discussion of affirmative defenses invited by certain charges.